When I think of summer libations, strawberries, lemonade and rosé wine instantly come to mind. While they're all excellent on a standalone basis, can you imagine how fantastic they'd be mixed together? I tested this theory with a punch-format cocktail and found the result to be absolutely wonderful. 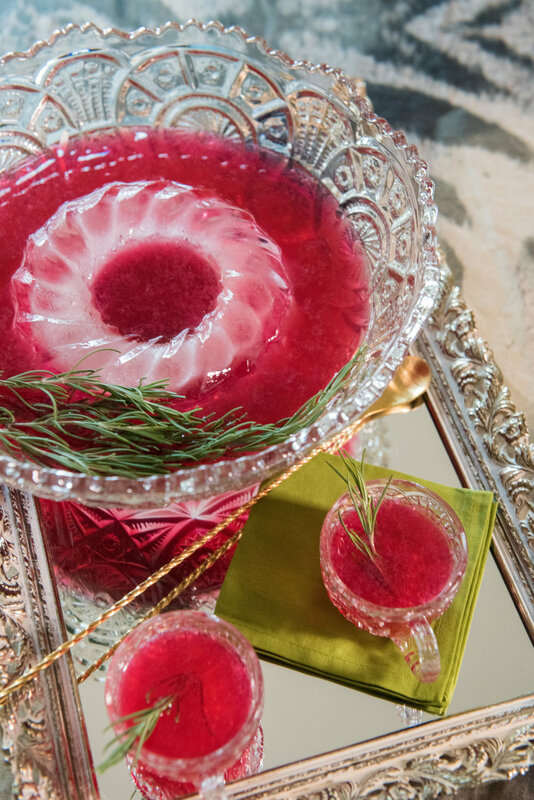 The natural red hue of this punch makes it a great fit for your Fourth of July entertaining, but it's a recipe you're bound to enjoy all summer long. One of my favorite features of this punch is that the ingredients can be prepared fairly far in advance and the final prep is effortless. Since the fruit components are preserved via infusion and cordial, you can find the freshest fruit when it's available or well-priced and use it before it has the chance to spoil. To give the punch a bit more of a kick (pun intended), I incorporated strawberry hibiscus infused vodka. The nice thing about a fruit infusion is that it provides so much flavor that you can, and should, use a more mid-range spirit - I picked an organic vodka from Trader Joe's, which I'm convinced is made by Prairie Organic but with the friendlier price tag of $13.99. I recommend using organic fruit for infusions as alcohol will pull any pesticides from the fruit along with the color and flavor. Luckily, organic strawberries are much easier to come by in the summer. Hibiscus is best bought in bulk online, but you can also use a hibiscus tea from the grocery store. Note that you'll need to plan ahead for this component of the punch as fruit infusions reach their peak after 5 days. Instead of using fresh lemon, I chose to work with lemon cordial. I discovered lemon cordial when collaborating with the Bar Manager of Chicago Distilling Company on a bar takeover and have been using it in pretty much everything since then. Lemon cordial is effectively a lemon syrup, something akin to limoncello but quicker to make and non-alcoholic. Lemon juice is best enjoyed on the day it's squeezed, but lemon cordial allows you to preserve that flavor brightness and achieve both tartness and sweetness with one ingredient. The basic premise is to boil lemon peel with water and sugar, mix in lemon juice, pour into a sterilized glass bottle and store in the fridge (more details in the recipe below). I also recommend adding some citric acid to strengthen the tartness, but you can substitute with fresh lemon juice when preparing the actual punch if you prefer. The rest of the punch is quite straightforward - rosé as the main component and club soda for a bit of fizz. I found this particular rosé to work beautifully with the other ingredients, but most fruit-forward varieties should fit the bill. If you want to class up the punch for the 4th, float some rinsed white spray roses in the punch bowl or garnish with fresh blueberries. The resulting drink is fruity, balanced and unbelievably smooth. Stir all ingredients with ice to chill and pour into your favorite celebratory glassware over ice. 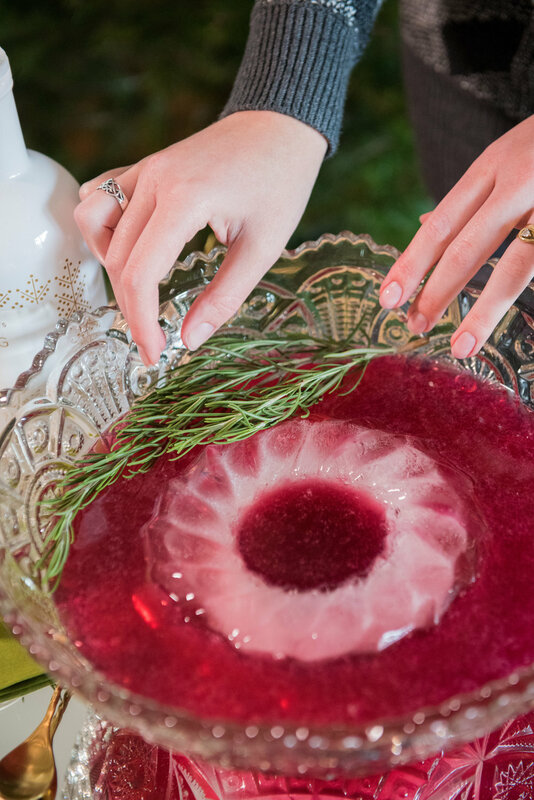 If making in bulk, simply mix in a pitcher or punch bowl with a bit of ice. For an extra festive experience, garnish with white spray roses and blueberries. Enjoy while reliving your childhood amidst firework fun. * To make strawberry hibiscus infused vodka, add 2 cup chopped strawberries, 2 tbsp dried hibiscus flowers and 1 bottle of vodka to a sealable glass jar (split into 2 batches if you don't have a 1 jar that's big enough). Put the jar in a dark place (like a cupboard or pantry) and allow to infuse for 5 days, shaking occasionally. After 5 days, strain with a fine mesh strainer. The infused vodka should be fine to store at room temperature if you remove all the fruit solids. 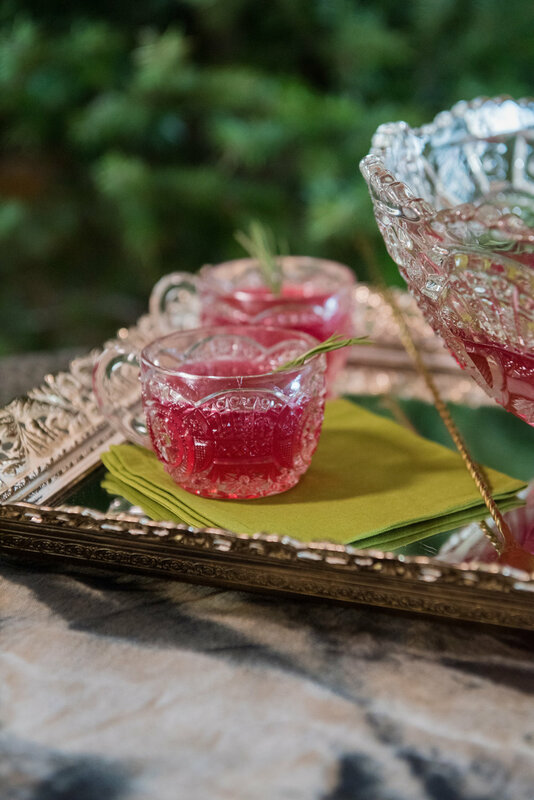 Thanks to Belen Aquino for the stunning cocktail photography and to Gather Vintage Tablescapes for the beautiful vintage glasses and pitcher. If you're local to Chicago and want to learn how to craft some delicious punches in person, check out my upcoming class with KOVAL and West Elm. A month ago, I was approached with a project to design two cocktails for the anniversary party of a local clothing and accessory boutique and the launch of a related bridal boutique - Milk Handmade and Honey Bridal. This particular cocktail was my solution for the milk-themed half of the event, and I was pleasantly surprised by how delicious it turned out. I don't typically mix with dairy to keep my drinks a little lighter, but dairy can be so effective at giving cocktails a silky smoothness and balancing the bite of most spirits. Earlier this year, I discovered turmeric for natural health purposes and found that it is often enjoyed with milk and several other spices for an immune system boost, cold relief, and a slew of other benefits. Conveniently, I also found turmeric to be delicious. It can be overwhelming in large quantities but wonderful if used in a balanced way, sweetened with some honey, and paired with ginger. Turmeric root powder is typically easier to find than the actual root, though the root can yield a more vibrant flavor if you're up for the extra effort. If you go the powder route, I highly recommend saving some money by stocking up bulk. I chose to add turmeric to the punch via a simple syrup made with turmeric powder and added a bit more spice and sweetness with KOVAL's Ginger Liqueur. For the spirit, I selected KOVAL Oat Whiskey for its amazingly smooth, almost creamy finish. The natural sweetness and mouthfeel of the the Oat Whiskey make it my go-to for more decadent dessert drinks. For the milk, I chose an organic 2%. Personally, I find skim to be rather flavorless and whole milk to be too heavy, so 2% was a great balance for the little bit of fat content and flavor to round out the drink. If you can, try to use organic as pesticides are easily transferred through the fat content of dairy. If you prefer to go dairy-free, a blend of full fat coconut milk and almond or cashew milk should make an effective and tasty substitution. This drink can easily be presented individually, or scaled up as a punch. The only component that takes a bit of effort is the turmeric syrup but that goes quite quickly when using powder. I added some candied ginger cubes for garnish for an extra spicy treat and some more visual interest. The resulting drink is a beautifully colored, lightly spiced boozy milkshake that is actually somewhat good for you! Stir first four ingredients with ice until chilled, then strain into a tall glass over ice. Garnish with a piece of candied ginger on a cocktail spear. If making in bulk, prepare in a punch bowl or pitcher with chilled ingredients and serve with ice. Enjoy to cool down and give your body a boost on a hot summer day. *To make turmeric syrup, add 1 cup water and 1/2 cup sugar to a small saucepan and heat until sugar is dissolved. Add 1 tbsp turmeric powder and stir until dissolved. Allow to cool and store excess in the fridge for up to 3 weeks. Some separation will occur - just shake up the syrup before use. Thanks to Belen Aquino for the stunning cocktail photography. You can find the West Elm items from this shoot, here, here, and here. Cocktail picks are by Viski.